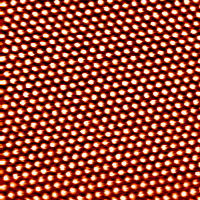 This is a 6nm × 6nm image of the surface of highly ordered pyrolytic graphite (HOPG) taken using a scanning tunneling microscope (STM). Each dot represents an individual atom. 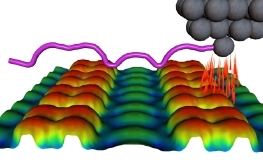 We are currently using this powerful technique to study the two-dimensional carbon allotrope graphene. We resolved the atomic structure of the GaAs(001)-(2 × 4) reconstructed surface using our STM and first principles calculations from P. Kratzer and M. Scheffler at the Fritz Haber Institute in Germany. This surface is the starting surface for the production of the majority of all compound semiconductor devices such as: lasers in CD-players and high speed transistors (HEMT) found in cell phones. 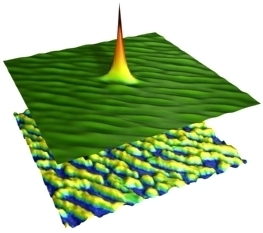 We discovered that the GaAs(001) surface behaves as a 2D lattice-gas Ising system. The STM images the occupied and unoccupied domains of the lattice gas on a scale comparable to the constituents of the gas, give never-before-seen insight into the Ising model. Correlation functions, directional nearest neighbor coupling energies, and four critical exponents are measured.